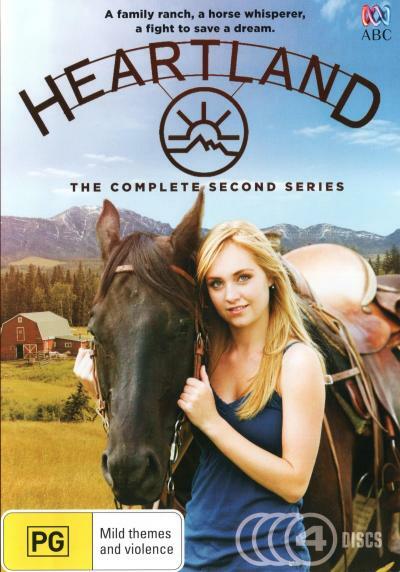 Heartland complete series 2 DVD from DVDLand. Based on Lauren Brooke's young-adult novels, Heartland tells the story of a family that runs a farm for abused horses. When the farm runs into financial troubles, Lou (Michelle Morgan) must leave her fast-paced life in the city to return home and help her sister, Amy (Amber Marshall), save it from foreclosure. The two sisters quickly get back in the business of healing horses, but manage to leave a little extra time to spark romances with the local boys. Special Features includes behind-the-scenes featurettes and extensive interviews with the cast and crew. Click the button below to add the HEARTLAND - COMPLETE SERIES 2 to your wish list.